300. And no, not muscled men with hard abs. If you are a new DM in particular, this may be of some use for you. 1. The token tutorial. This is probably the article that put the blog out there and exposed it to a larger audience than just the RPG Bloggers Network was giving me at the time. 2. The “scale your maps up and print them” tutorial. It was just a natural follow up to the tokens that had to be done. 3. Advice for new DM’s only. At the time it was some stuff I had learned about DM’ing, and wanted to share it with other new Dm’s out there. It still holds up. 4. Battlemap Tutorial by Jonathan Roberts. One of my favorite tutorials on the site, by a great artist and all-around good guy. He’s a working cartographer who had no reason to do this, but he did, and I’m grateful for that. 5. Reskinning advice. Really shows new DM’s just how easy it is to bend the game to your particular needs. I’m quite proud of the way I turned a drow into a dinosaur, if I do say so myself. 6. Making your own Dungeon Tiles. A great guest post by a reader of the blog. It is what it is, making your own Dungeon Tiles. A great article. 7. Don’t make your PC’s ride the Newbie Railroad. Aaaall Aboooard!! My thoughts on how new DM’s can think on their feet and avoid railroading their players. This article is, for some reason, a big StumbleUpon traffic driver. 8. The DM binder. A nice post on introducing new DM’s to the concept of a campaign “bible”. 9. Adding a 3d element to Dungeon Tiles. I wrote this small article as I was experimenting with making Dungeon Tiles more versatile. Maybe someone at Wizards was reading, and that led to their current 3d tiles stuff? Nah. Not likely. 10. 3 Act Structure in your games. A more recent article, but one that I am really proud of, as I was able to combine my two favorite hobbies: gaming and screenwriting. I’m sure there are some I’m missing, but those are the ones that stand out the most in my mind. I hope if you are new to the site you read those, and they help you out in some way. 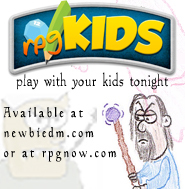 And lastly, I wanted to take the time to talk a bit about rpgKids, the rpg for little ones I recently self published. That game’s success would not have been possible without a bit of help from the fact that I had a blog to highlight it with, and the readers to download it and apparently enjoy it. So a big thanks go out to you readers that played it when it first came out as a free download last year, and a huge thanks to those of you that have bought the new version. I hope it is enjoyable to you and your kids. So that’s the 300th post. Thanks for reading and hope to see you around for the next 300! Damn. That’s a lofty goal. ← Warstories: Play Your Guy Right! Congrats on 300! There will be many more, I’m sure. And grats on rpgkids as well! Congratulations on 300 posts! Keep up the great work, it’s been a blast reading all your interesting and insightful posts. 300!! That rocks!! I have to say the best post has been the scaling battle maps. For me anyway. It has helped me so much. I now make maps for my group that is playing through the 4E adventure path. Only bad thing about it is that I’ve had to spend a bundle of money on ink!! Keep the posts coming and I’ll keep coming back. Congratulations! Keep the amazingly good work up. Thanks for the nice post. Just started dipping my toes into the community of blogs for DMs and DnD, and it was awesome to find you and your site via Twitter. And this is the exact post I needed as a guidepost to your site. Excellent! Ah crap! Now I have to do a 300th post? Well congratulations on making it to 300! I love your site, I hope the awesome keeps flowing.